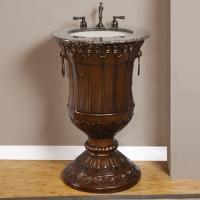 Looking for something to provide a wow factor in your small half bath or washroom? 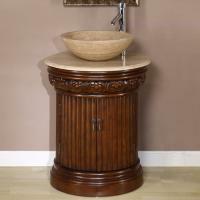 This rounded vanity with granite top and under mount sink hints at luxury without taking up much space. Single cabinet opens on a shelf to store linens or soaps. Unit comes fully assembled and ready for plumbing. Material: This bath vanity is constructed of a combination of solid Poplar hardwood, select veneers and high grade medium density fiberboard. 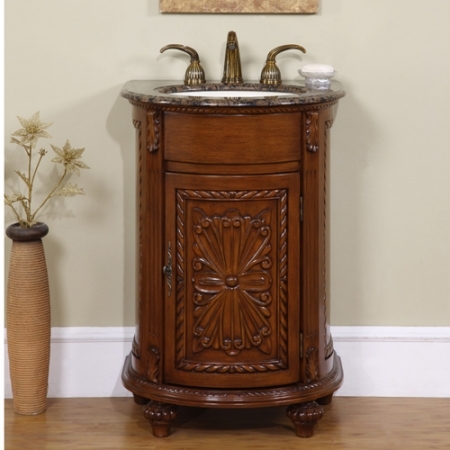 The framework of the cabinet is hardwood, and the ornate trim and the elegant features are MDF. Poplar is one of the most common used woods to build furniture framework and paint grade cabinets. It has a tight smooth grain. Poplar grows very tall and straight so getting lumber in wide widths and long lengths is easy. In woodworking, veneer refers to thin slices of wood, usually thinner than 1/8 inch, and is glued onto core wood panels to produce flat panels such as doors, tops and panels for cabinets. MDF is ideal for ornate accents and carvings due to its consistency. It takes paint well and provides a durable finish. All hardwoods have been Kiln dried to ensure a stable product that will not expand, contract, or warp. Counter Top: Granite is a hard non-porous surface, which makes it an ideal material for countertops. Granite resists heat, scratches and stains, and protects against mold and mildew. It is recommended that you seal granite every 6 - 12 months. Fully Assembled: The base cabinet is ready for installation right out of the box. The countertop and sink will be attached to the base cabinet. Some furniture style vanities are shipped without the feet attached, which require installation by simply screwing in, all parts included. 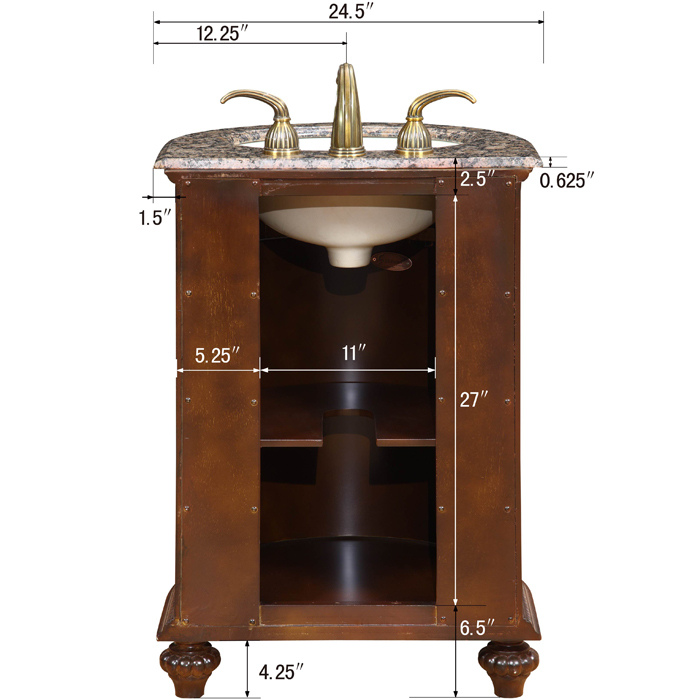 If it's a modular vanity, the vanity may be delivered in more than one piece, which is noted in the table above. These are designed to be set next to each other with no additional installation. If additional accessories are included, such as faucet, mirrors, etc., these accessories will require installation. Includes an open space for plumbing accessibility. Recently remodeled a bathroom and installed the 24" vanity. The size is perfect and the quality of the wood is wonderful - not your typical "Made in China" home-center fare. Installed a Grohe Swarovski crystal faucet and a mosaic glass tile backsplash to match the floor tiling. Everything is absolutely beautiful. I am extremely happy with my granite top vanity. The height is comfortable and the wood work, beautiful. It has made a wonderful addition to my renovated powder room. The unique staff were helpful and polite. Looking forward to my next unique mirror purchase. Remodeled a half bath, size was perfect again to open up the room with new tile flooring as well. Quality of this piece is A1A! UniqueVanities a great site with great customer service too! 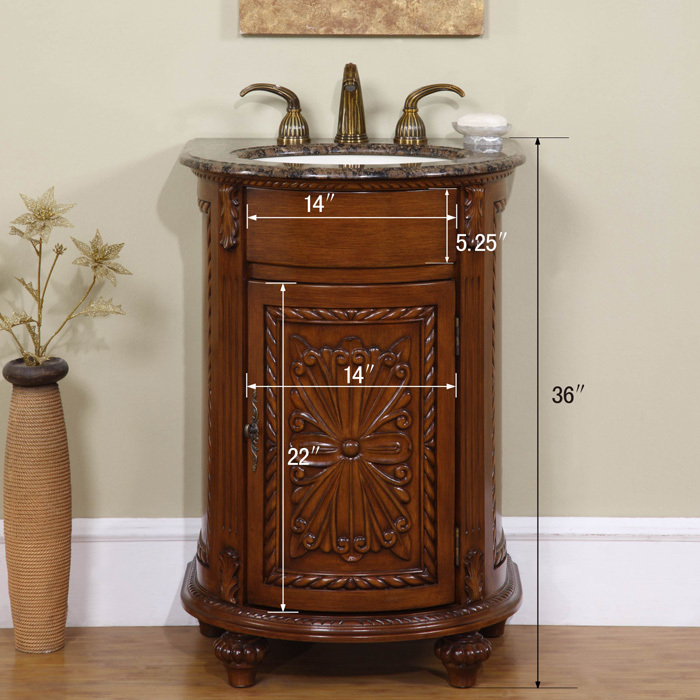 The online purchase and delivery of our vanity was completely hassle free, we had searched quite a while before we found our lovely vanity at your site. Very classy! Haven't installed it yet, but I am sure it will stand out in the bath room. Q: I have a tight space and was wondering if you can tell me what the depth is from the back of the top to just where it starts to curve in the front? A: It is approximately 18 ºî.